Take almost any child to water and she'll want to peer inside, look for fish, watch ducks and splash the surface. 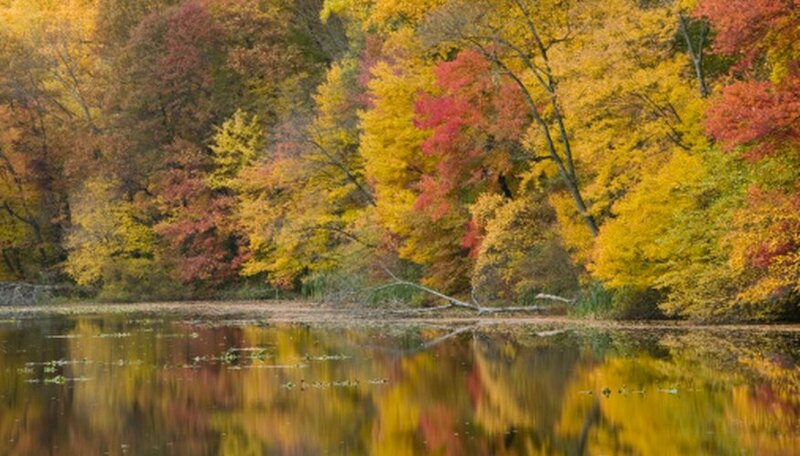 Ponds are intriguing and near mystical in certain conditions, like when mist settles over them or when they reflect the colors of an autumn afternoon. Life at a pond is varied and can be most exciting to children, especially when guided carefully by parents or teachers who are informed about the delicate environs and the interdependency of life forms. Ecosystems are the biological organism communities that rely upon one another for continued life. These can be pristine settings where reeds grow, breezes create ripples and many types of animals thrive. Or they can be dank, polluted and nearly lifeless. 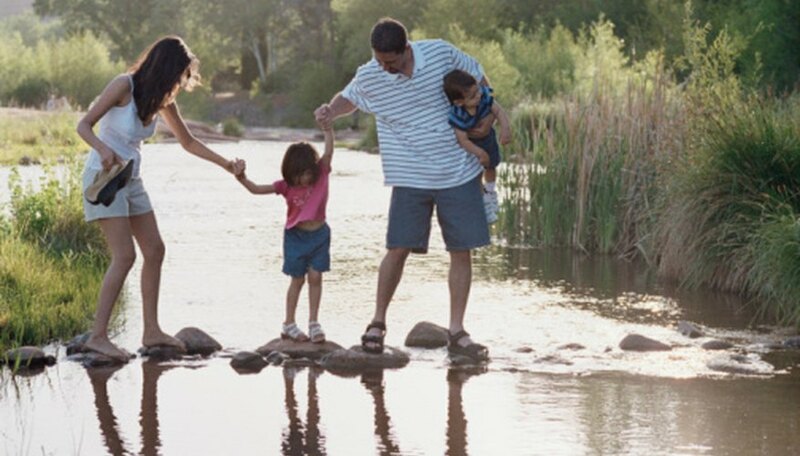 If you have a pond near your home or school, take children down to the pond's edges to explore. Discuss the importance of the sun to plant life, the bacteria or algae that grow naturally and how air quality and temperature affect what kinds of plants and animals can grow and thrive in the area. Each pond's specific ecosystem takes all of these into account. Trails near the ponds, bridges and piers can offer lookout stations to hunt for all kinds of "critters." Ask the the children to point out and list the types and colors of water bugs, dragonflies, ladybugs, beetles, spiders and other insects. The kids may find them directly on the water or on plants nearby. Point out the cattails and water irises and any wild plants that may be floating in areas -- like loosestrife, mallow, milfoil and water lilies -- all of which provide shelter, food sources and security to various bugs and other creatures. You might see tiny fishes and tadpoles, or hear toads and frogs, which are especially exciting for children to actually discover or find hopping around. Talk about the life cycles as observers so as not to disrupt any habitats. Numerous birds make homes and nests around ponds. In winter, try to find higher nests in deciduous trees when leaves have fallen. In spring, ducklings often appear with their mothers, sneaking out from reeds or darting behind them when afraid. Respect nesting areas for ducks, herons, egrets and other birds, so don't let children poke sticks or cause any harm. The presence of birds helps to contribute to the ecosystems balance. Discuss how birds help keep down mosquito populations or how their food comes from plants nearby. Watch what the various birds eat. (A pair of binoculars is a good item to carry along.) Raccoons, deer, coyotes and other wildlife visit ponds for water or for resting places and food sources, too. Bird and wildlife waste contributes to reseeding and nourishment of plants. Find tracks in mud and identify them. Talk to children about how humans rely on clear water, but so do animals and plants. The effects of pollution aren't always obvious, but close investigation by sampling water will yield a lot of information. Avoid throwing trash into ponds; recycle plastic and metal containers. if you and the children are using sunscreen and you touch or wash your hands in the pond, you will likely notice a film that floats off. This can harm the ecosystem. Fishing at a pond might be educational in some ways, but using nets will cause fewer damaging results -- especially if you release the fish. Utilize resource centers and nature exhibits at pond sites. Take along cameras and sketch pads for children to record moments and sightings, but leave the area as undisturbed as possible. Debra J. Rigas, a professional writing coach, has been a writer and editor since 1975. She is the author of the nonfiction book "Everyone's A Guru" and has edited novels ("The Woman Pope") and worked in arts and sciences as a filmmaker, boat captain, landscaper, counselor, theater administrator and licensed midwife. Rigas, Debra. "Ecosystem of Ponds for Kids." Sciencing, https://sciencing.com/ecosystem-ponds-kids-8408140.html. 25 April 2017.